An easy to put recipe for Knol Khol Kurma / noolkol kurma / turnip kurma that can be made in minutes. 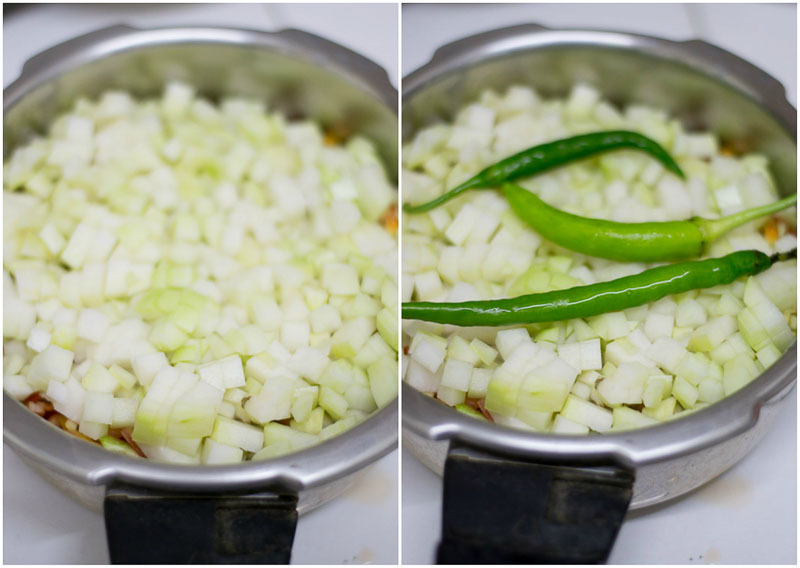 Perfect side dish for chapati or pulao. Recipe with step by step pictures. 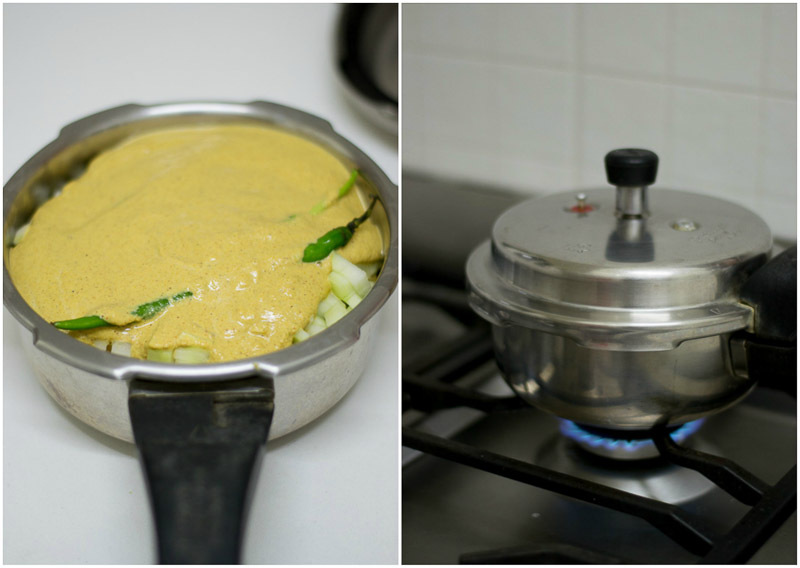 These days I do most of my veggie kurma using the OPOS – One Pot One Shot method as the taste of the kurma cannot be beat and the whole dish is ready in ten minutes. 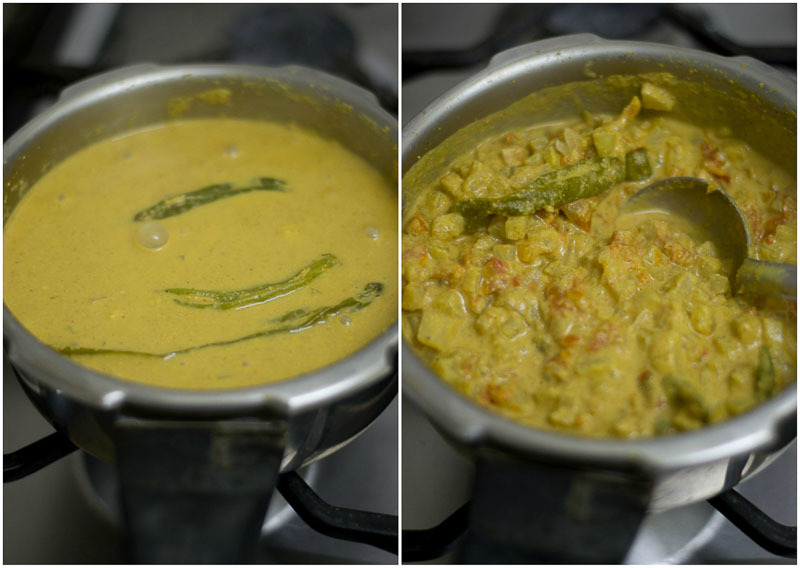 The whole rage for the Kurma made in OPOS originally started a couple of years back with this recipe for Saravana Bhavan style vegetable kurma. If you are new to this or want to give OPOS a try, then you need to try this recipe. It not only gets ready in 10 minutes, its super delicious too. No frying, No sauteing, No mess. Just try once and I am sure that you will be a convert. This is an OPOS – One Pot One Shot inspired recipe. This recipe will work only in a two or a three liter pressure cooker. Using a bigger cooker may burn the ingredients. So, that’s a word of caution. 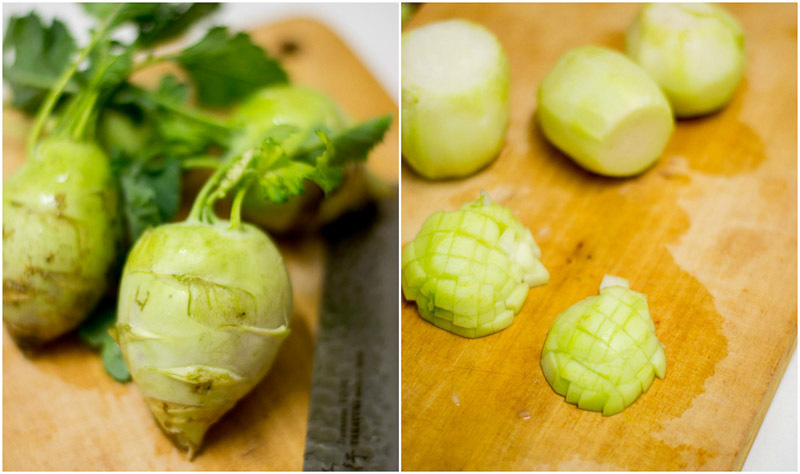 Peel and dice the Knol Khol / turnip and set aside. Now we will layer everything in a cooker. Take a two liter cooker and add in the finely chopped onions. Remember that I did not even add oil to the pan. This is an oil free kurma recipe that comes out so well. Followed by the onions, layer the finely chopped tomatoes. Make sure that you are chopping the tomatoes fine. Now layer the diced knol khol and whole green chillies. I did not chop the chillies. The chillies are only for flavour and aroma. Now, we will grind all the ingredients listed under “masala” to a fine paste. Take a mixie jar and add in the khuskhus, almonds, coconut, ginger, garlic, salt, coriander powder, green chillies and kurma masala powder. In place of kurma masala powder, I have used Sakthi chicken masala powder today. Even garam masala would work. Grind everything with little water to a fine paste. Spread it on top off the veggie layer. Remember that we did not add any water. The moisture from the veggies will suffice and the flavour will be concentrated. Cook for 4 whistles on medium flame. Remove from heat and let the pressure from the cooker release naturally. Knol Khol has a lot of water content. So the kurma should be the right consistency. If the kurma is very thick, add in half a cup of hot water to the kurma and mix well. 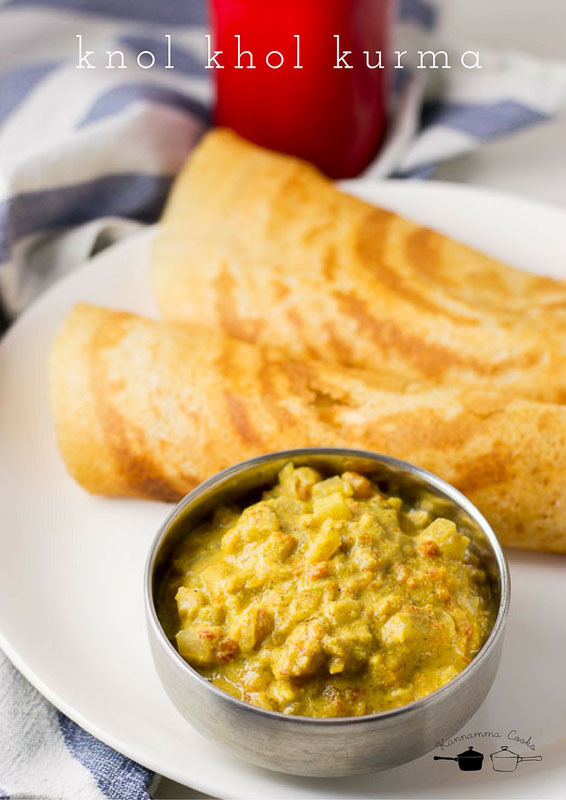 Serve the Kurma with dosa or chapati. Take a two liter cooker and add in the finely chopped onions. 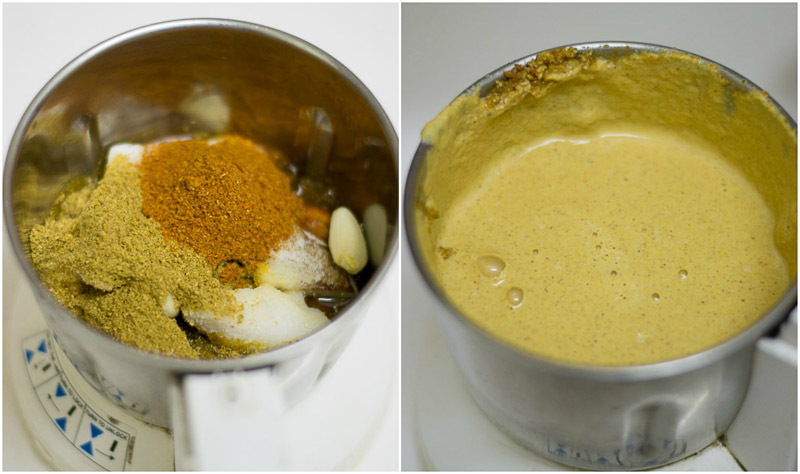 Grind all the ingredients listed under “masala” to a fine paste. Spread the masala on top of the veggies. Cook for 4 whistles on medium flame. Let the pressure from the cooker release naturally. Add in half a cup of hot water to the kurma and mix well. Dont be tempted to add water. 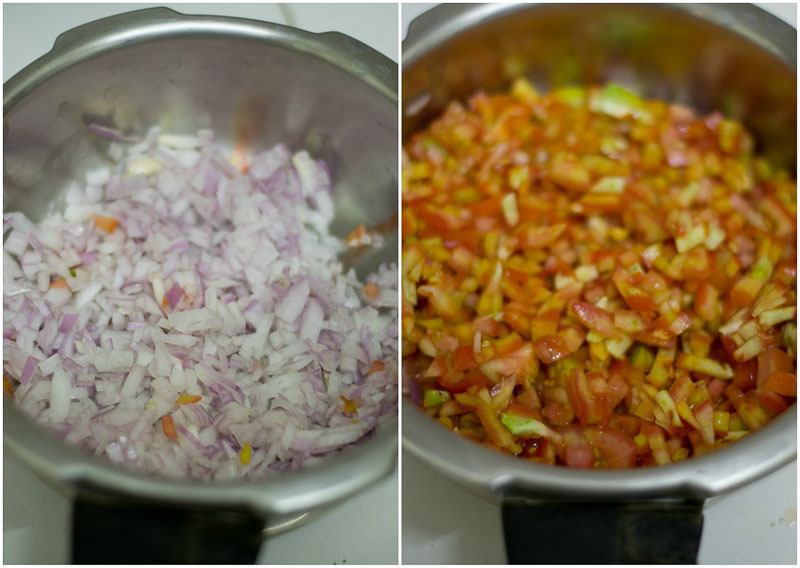 The water in the onion, tomatoes and the veggies are enough to cook the kurma. Thats the main thing about OPOS - concentrated flavor. The term OPOS and One Pot One Shot are registered trademarks owned by Mr.Ramakrishnan. 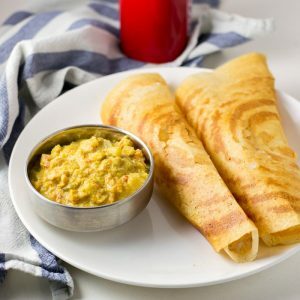 They are used in Kannamma Cooks with prior permission. Hello can we use any other vegetables for this type of kuma? I tried knol khol it came out very well thank you! 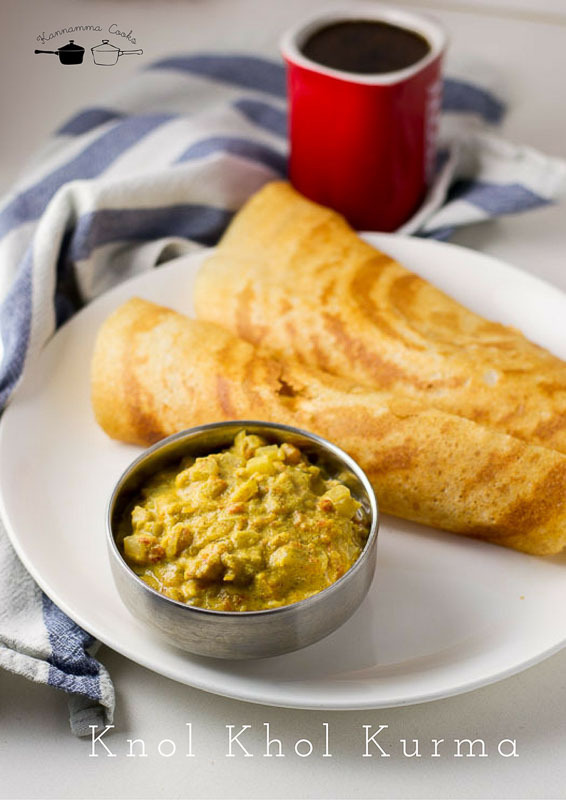 Thanks Suguna for this yummy recipe. Will it surely work in a 3L cooker as well? Great recipe. I reduced the green chilli for my husband’s sake. Very nice oil free recipe. I am definitely going to try this. Thank you mam for yet another fab recipe. Tried cooking turnip for the very first time and it came out really tasty. The no oil factor was a big plus and i can see this becoming a regular in our kitchen.